Flutter where the summer birds sing." 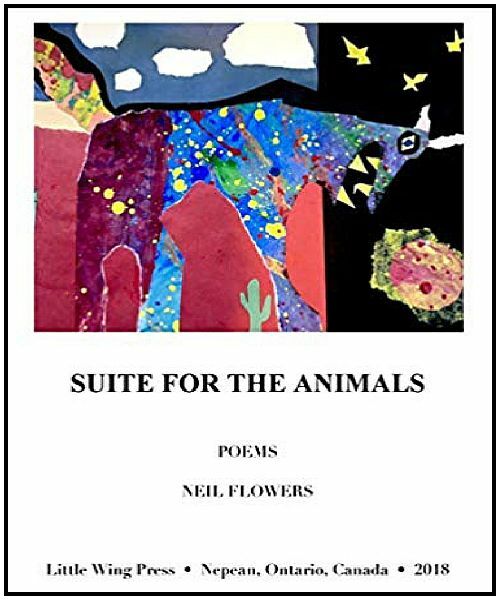 Suite For The Animals is an exciting celebration in Romantic and Beat poetry progressions from the Quebecois Poet Neil Beethoven Flowers. Poet, Script doctor and Screenplay writing teacher he frequently travels from L.A. to Ottawa and various locales in-between. He has lived in a number of places including Peterborough, British Columbia, Italy, Mexico and New Mexico. This is the second Chapbook This Writer has reviewed by Neil Beethoven Flowers, the first being TaxiCab Voice. The theme of wild animals pervades this series of poems, an on the beat travelogue that records the Poet's experiences in stories from Peterborough, Albuquerque, Mexico and California. This poetry full of mystery and Romanticism is reminiscent of the work of William Blake, an important precursor of the Romantic movement, Blake wrote about the reverence of animals and nature, accentuating spirituality and questioning negative cultural practices. It differs from Blake in that its short staccato lines of the Beat Poetry tradition are a little more dislocated, a beautiful progression. The poems present stories, stories of animals, there is the story of someone losing everything in a truck fire, a story of swimming with turtles, a story of seeing tigers, there is a flash of humor, a reference to Hopi myths, a conversation with ravens ("Raven Talk"), a night of drinking with friends, a eulogy and more. A poet's life in existence within the harmony of nature inside spiritual climes, the poetry a vacances of it's a beautiful life, a brilliant write, Suite for the Animals by Neil Flowers.